“Have you noticed a pattern — Sunbury is pretty well-represented this week,” said auctioneer Dan Boysel as the Delaware County Junior Fair Livestock Sale was winding down Tuesday night. The Village did do well. By our unofficial count, a fourth, or 43 of the 161 animal exhibitors who sold animals or dairy baskets in the Junior Fair Arena, either lived in Sunbury or belonged to a Sunbury-based 4-H club. There were also four from Galena. That’s not unusual, but it seemed like there were more winners from Sunbury in marquee categories during Tuesday’s sale than in recent memory. For example, the Grand Champion Market Beef, one “Crazy Louie,” was exhibited by Gabriel McCaulla from the Eagle Country club. Young Gabriel was assisted by Abby Facemyer with the 1,251-pound steer, which fetched $4,100 from Sunbury-based Forman Realtors. Not to be outdone, the Reserve Grand Champion Market Beef exhibited by fellow Eagle Country club member Sarah Barth received $4,200 from what Boysel called a consortium of buyers from Sunbury. In addition, the Champion Market Dairy Goat Wether was exhibited by Nathaniel Warrick of Sunbury from the Bitz ‘N Pieces club, and received a dairy goat-leading $1,000 from the Meijer stores in Delaware, Lewis Center, and Powell. 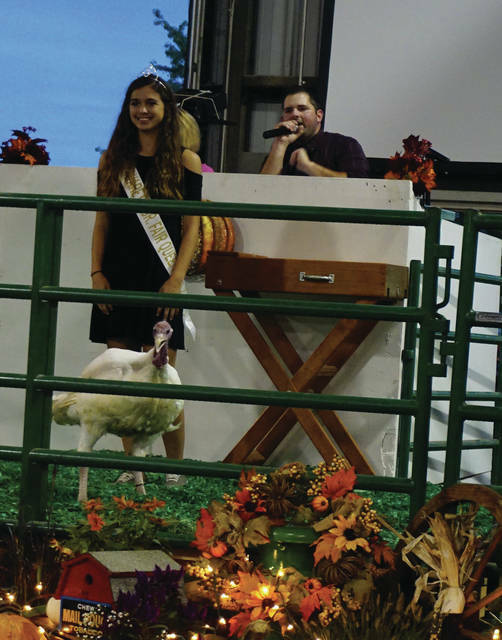 Junior Fair Queen Kaitlin Meade, who was busy dropping off photos of winning exhibitors and their animals to the bidders, also entered the auction ring with her Champion Meat Turkey that went for a top bid price of $1,500 to Performance Auto Delaware. Other winners included: Jori McBurney-Buell of Galena with a Champion Pen of three Fryer Rabbits that sold for $2,000; Melvin Zane of Radnor with a Champion Market Boer Goat that went for $1,100; and Maggie Pyle of Delaware and Ashley County Liners Club with her Grand Champion Pen of three Meat Chickens that fetched $1,000. Facemyer, from Centerburg and Eagle Country, was a winner too, receiving $1,200 for her Beef Feeder Intermediate Showmanship winner. A couple wrinkles in this year’s event: The Dairy Basket sale was expanded from one to seven exhibitors; and one chicken was displayed instead of three to make it easier for the student-exhibitors. It was muggy in the arena, and volunteers offered bottled water, brownies, and hard candy to the bidders midway through the three and a half hour session. Fair Queen Kaitlin Meade of the Kountry Kids club in Sunbury poses with her Champion Meat Turkey during the 2017 Delaware County Junior Fair’s livestock sale on Sept. 19. The bid price was $1,500 from Performance Auto Delaware.